Try this great recipe out for Chicken Madras, really great results in a few easy steps – made even easier with my secret ingredient ‘Onion Masala Base’ – a universal curry paste created similar to the ‘onion gravy’ used in British Indian Takeaways/Restaurants for that authentic curry taste. 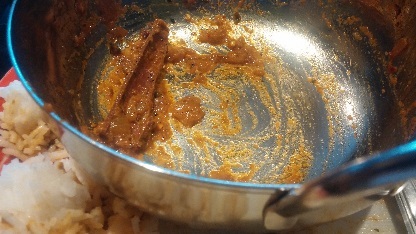 Spices – dalchini cinnamon sticks, turmeric powder, indian bay leaves, dried fenugreek leaves, green cardamoms, rajah mixed masala curry powder, chilli flakes, lemon juice, salt. Heat 3 tbsp of cooking oil in a pan for about 30 seconds on high heat. 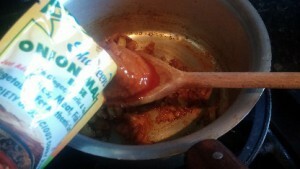 Reduce heat to medium and add the chopped onions and stir for a few minutes until lightly brown and soft. 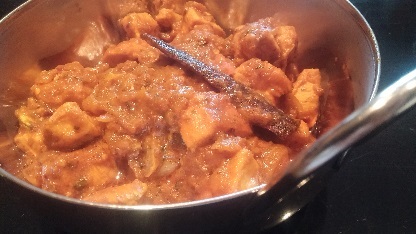 Add about a 2 inch stick of dalchini cinnamon, 2 indian bay leaves [torn], 1 tsp turmeric powder, 2 green cardamoms, 1 tbsp rajah mixed masala curry powder, 1 tsp tomato puree and stir. Now add all of the Shaheens Onion Masala and stir in well and cook for a few minutes. 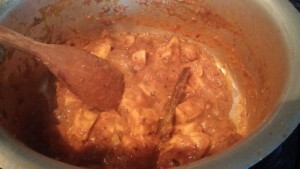 Add 500g of cubed chicken breast and stir in well, then cover pan and cook for about 5 minutes stirring occasionally. Now add about 200ml water and continue to cook covered for about 5 minutes stirring occasionally. 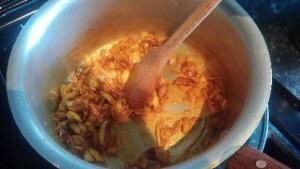 Uncover and add 2 tsp lemon juice, half tsp chilli flakes, 1 tsp dried fenugreek leaves, about half tsp salt [or to taste]. 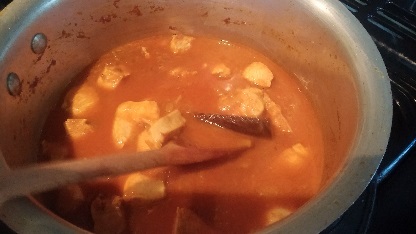 Cook uncovered for 5-10 minutes to reduce and thicken. 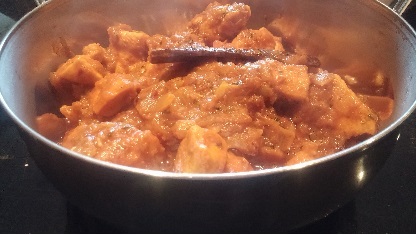 Ensure cooked through and serve hot with indian bread and basmati rice. Tips: I like my curries quite thick , if you prefer more sauce reduce it for less time so it does not thicken as much and use less onions at the beginning [or dice up onions finer]. Watch out for the green cardamoms once cooked, not everyone likes biting into these whilst eating so it may be wise to fish them out before serving!